Life at Loyola is not just bound to the campus and surrounding neighborhood (even though Roger’s Park is the most diverse neighborhood in the city, and thus lots of fun). Downtown Chicago has a lot to offer! My family came to visit me recently, and although we had done this about four years ago when I was just touring Loyola (so very long ago! It seems like worlds away now), we decided to do it again. These tours are so much fun! 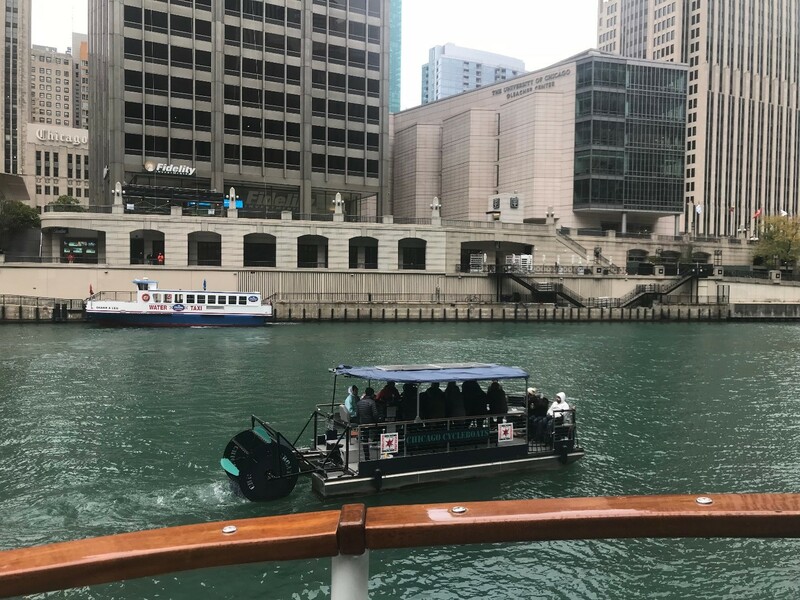 Run by the Chicago Architecture Center, their most famous tour is seeing the city on the river, by way of a boat! 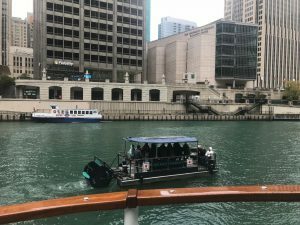 Although they also have indoor tours and walking tours, there’s not a lot of opportunity to get on the Chicago River like that. They also come with a volunteer docent from the Chicago Architecture Tour, so you get a full narration and someone who answers questions with enthusiasm, not just some recorded voice. My favorite thing, although I haven’t done it yet, has got to be that they offer them at sunset too, so you can get just the most beautiful views. Chicago in the sunset is absolutely gorgeous no matter where you are, since the downtown is laid out like a grid and the sun sets along the lines most times. There are some streets you can walk through and just feel like you’re entering a whole new world because of how strongly the sun shines and wraps you in orange. I love this city, and I love that the Chicago Architecture Center offers these tours! Unfortunately for my experience, we went on a windy, freezing day that had Chicago’s first snow of the year! Granted, the snow only lasted about five minutes, but it drove most of the passengers who thought they could hack it on the open top of the boat down below, into the first floor of the boat that had heating. Plus, the wind was so strong it blew some cushions right off of the top of the boat! The employees didn’t seem too bothered by it, so I can only assume they have some kind of cushion-catching plan. I lasted out there up top until the very end, when we went out on the lake, at which point I just had to go inside. The above picture is me in the foreground, surrounded by my family. Don’t we all look happy about the weather? The tour itself was really exciting, especially for a history major like me. It’s only 90 minutes, but they go over 50 buildings, new and old, to learn about Chicago’s history – from the Great Fire to how architects are dealing with the difficulties of building on the land around the river, and more. The first great merchants of Chicago and the modern ones, artists who have made beautiful things here in this city who have recognizable works in other places as well. The list goes on! If you’re looking for something to do, I totally think it’s worth it. I feel even more appreciative and knowledgeable about this city. One of the things I hear a lot from my friends and roommates is how little time they’ve had for their hobbies since entering college. Granted, we do have free time… But we spend it watching Netflix or laying on the grass in the quad instead. Without a music class or a motivation to pick up the paintbrush, it can be hard to choose that over something mindless and easy to unwind after a week of classes. 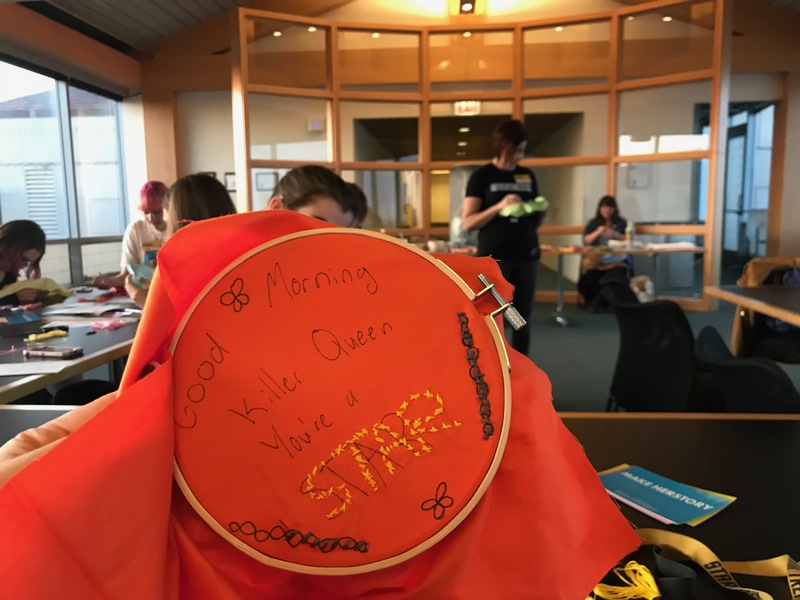 But luckily recently the Information Commons brought in a local craftswoman (and professor at DePaul University and Columbia College Chicago, and activist, and all-around cool woman) to offer an opportunity for students to take a bit of a break and learn how to cross-stitch! Check out her website here. Although technically she taught basic embroidery, people who came into this (like me) with stitching experience already could cross-stitch if we so pleased. I can’t remember the last time I did anything like this since probably middle school, so it was a real throwback. 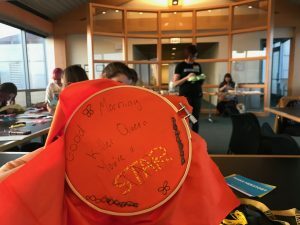 We had total free range to do anything we wanted, and Shannon (aka Badass Cross Stitch, the instructor) and the IC teamed up to bring us fabric, thread, and hoops that we could then take home if we didn’t finish in time. But actually, this event was put on as part of the Library’s #LoyolaVotes awareness, so there was lots of pre-made voting-related patterns available, and many of the other people there with me made things that read “rights are right” and “equality for everyone” and on that theme. There have been lots of events and tabling going on to promote voter registration, which I’m always impressed that Loyola does. One of the other things I really like about our library is that we have a monthly meeting where students can propose ideas to the library and talk about what we want to see from the Library/Information Commons. Although I can’t make it, after this event I really want to let them know that they should do similar things, more often! My roommates and I have paint supplies at our house, and I know we have time… but if we sat down and tried to do it together, we’d probably just lose ourselves in the talking and forget to paint! The moral of the story is that you never know what opportunities Loyola will bring you. And hold on to your hobbies! One of my favorite things about Loyola is the quest for knowledge outside of the classroom. My Astronomy professor, for example, recently sent out an email bringing to my attention a seminar about … well, ‘Cosmic Microwave Background Radiation’ happening this week. I know what all of those words mean individually, but I have to be honest, Astronomy is not my top subject. History, on the other hand? I’m a history major. Plus, one of my professors gives us extra credit for attending the lectures the history department sets up, like one I recently attended called “Living With Little Corpses” and examining infant burials in post-Roman/Early Medieval Britain. A wild topic, right? It was a great lecture, which I was not expecting, actually. I was very hesitant about the content – because Britain is not really in my area of study, nor is burials – or infants – but they had a small essay contest for a free copy of the speaker’s latest book (which I participated in and won, because 1. Why not and 2. I love free books), plus hors d’oeuvres and coffee. 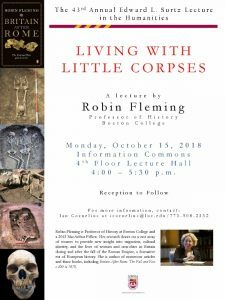 The speaker, Professor Robin Fleming from Boston College, was engaging, hilarious, and it turns out: had a very interesting topic, because it was a very interesting mystery. The essence of her speech was describing her findings studying graves made during post-Roman/Early Medieval Britain – and apparently, she found very few children’s bodies, which was odd given the child mortality rates of the time, and she found infant’s bodies buried beneath the floors of working buildings like stables and kitchens. The why is a puzzle to be solved, especially given that as the Medieval age dawned, children’s bodies start to re-appear in cemeteries while infant bodies vanish in graveyards and in houses (unless they are buried with adult men). All sorts of stuff I never knew about! Professor Fleming also chose not to use textual evidence during her research – well, sort of chose. Sort of.. Because there is no existing textual evidence! The texts we have regarding that age come either from across oceans and hundreds of miles away and deal with the elite class (while these burials were of common, peasant folk) or from hundreds of years after the fact, neither of which address the why anyway nor can be accepted as close enough to the truth. Other lectures I’ve attended this year included exploring the biology of the Black Death (and how it still exists today) and the history of human’s idea of Hell over the ages. Granted, I have only been attending lectures that the Medieval Studies department has set up, so it makes the topics a little dark so far. But I think one is coming up about the environment (as in, forests and land) in the Middle Ages, so maybe that one will be less gruesome. Only maybe. It is the Middle Ages, after all. 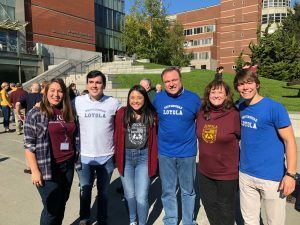 There’s lots to do at Loyola, from classes to take to organizations to join. One of the ones I’m involved in is Alpha Sigma Nu, the world’s one and only Honors Society exclusively at Jesuit universities around the world. We have a chapter at every Jesuit university in the USA, plus two in Canada, one in Spain, and one in South Korea! Only the top 15% of each junior and senior year classes are invited to join, and even then, we only accept 4% of the applicants. So you see, it’s pretty prestigious! We even have our induction ceremony in the beautiful Madonna della Strada chapel, where we have honorary inductees from the Loyola community and our President, whomever it may be at the time, gives a speech. I wasn’t able to make my own induction ceremony because I was abroad, so I knew I wanted to participate in this organization a little bit more when I returned – therefore, I joined the executive board as our secretary! Between me, the vice president, and the president, we do pretty similar roles, but the President has a little heavier of a burden. I’m pretty passionate about Alpha Sigma Nu, because I’ve recently been quite fired up about it – because I attended our Triennial Conference at Seattle University last weekend! 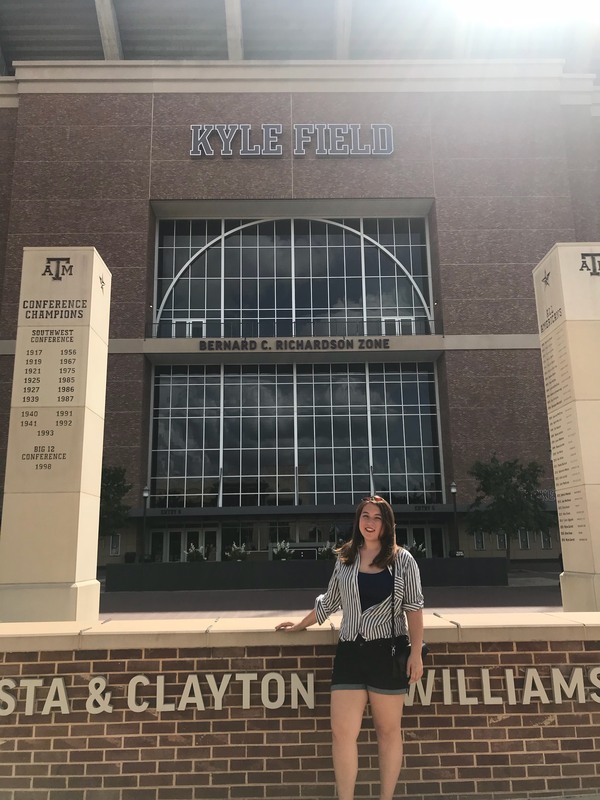 Alpha Sigma Nu covered the flight and hotel costs (and feeding us, which was absolutely phenomenal as a concept, but the food and drink blew us away too), so how could I say no, even if it meant missing some class? Actually, it turns out, the week of fall break, I was only in Chicago for about 30 hours before I had to take off and head off to Seattle. The Conference was a great time to meet other executive board members from other chapters at different school around the world – from Fran who attends Loyola Andalucia in Spain to Hanna at St. Joseph’s University in Philadelphia, even Georgetown undergrads and students from Wheeling, the smallest and newest Jesuit university in the USA, which is in West Virginia and has less than a thousand students. Not only were other students there, but so were Presidents of Alumni Clubs from around the United States and Board of Directors members too, so I really got to do some great networking while eating salmon and mashed potatoes. One of the best things about Alpha Sigma Nu is that it is membership for life, so many larger areas have Alumni Clubs you can participate in to live our values of Scholarship, Service, and Loyalty. I met a woman who is from just a town over from me back in Minnesota! Returning back from Seattle, the other Alpha Sigma Nu E-board members and I have lots of plans for events this semester, and visions of what Alpha Sigma Nu can do and be in the future. If you attend a Jesuit university, I totally recommend considering this organization if you get this invitation in your junior or senior year. From opportunities to meet the King of Spain,as many Jesuits and educators did at an international meeting of Jesuit-education members last summer to working with Jesuit Worldwide Learning (an organization that brings Jesuit education to refugee camps) to going on enlightening and fun trips, or just learning about and participating in volunteer activities with the Alumni Club, you never know where your Jesuit education will take you, but Alpha Sigma Nu can certainly link you up with more opportunities to explore the world! As fall rolls through us (and here in Chicago, faster than some other places), students have recently been let free on our Fall Break! With two whole (extra) days off of class, there are a million and one things students do. It’s so nice! Some of my friends just stayed home, catching up on Netflix and steadfastly ignoring midterms looming on the horizon. 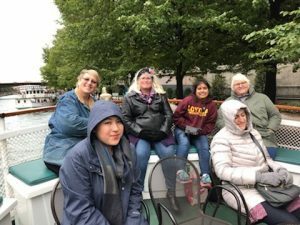 Others went to their hometowns, doing laundry, petting their dogs, and eating homemade food – a welcome relief after they’ve been making ramen for the past two months. Some people take this time to double-down on work and get those $$$, and some – but very few, considering we’re college students who could save this money and eat around Chicago or pay rent – travelled. I don’t know about what you did the first weekend of October, but I was one of the travelling few. Well, it wasn’t just for no reason or sightseeing. One of the hardest things about college is how your friends split up and scatter around the nation. One of my highschool friends went up back to her native Canada and we hardly ever see her. Another fled down to Texas to study near family, although most of them just moved over to Wisconsin for schooling. Besides Canada and Texas, me being here in Chicago is the farthest-away of our tight-knit group of friends. Because Texas’ parents moved to Austin as well, she doesn’t get much opportunity to come back north to our hometown in Minnesota to see us, and it’s really hard for us to go down to her. But that’s what I did! A shaky (but cheap) Spirit airlines ride from O’Hare and there I was in sunny, summery Houston! I’m very lucky she mostly takes online classes so we could drive to Austin and I could take up her time on Monday and Tuesday too. It was a great experience for me to see her college friends and her college – Loyola, being around 15,000 (last I checked), is not too small of a school. 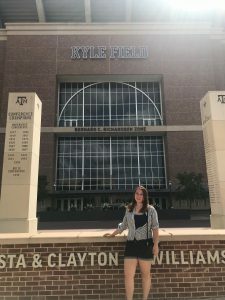 But she goes to Texas A&M, with a student body of over 60,000! They are steeped in tradition, despite being younger than Loyola, and if you don’t have a car or a bike to get around campus – you can take the campus bus or you’re screwed! It’s been a long, long time since I’ve been on a different school’s campus, and it was a flashback to my college touring days for sure. One of the reasons I chose Loyola was for its medium size, so I could run into friends between classes and walk from one end to the other without being in a huge rush or a risk of being late to classes. That’s my style. Hers is driving and having a few hangout spots with her friends in a sea of people. It all depends on you! Whether you’re considering a large public school, a small or medium private one, or anything in between, it’s important to carefully weigh your style (or what you want your style to be.) But most importantly, I think, it’s important to hold on to your friendships from earlier in your life if you like them – and take opportunity of breaks!